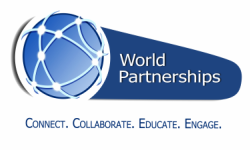 In 2015, World Partnerships was selected as the host organization for the 10th anniversary of “Edward R. Murrow Program for Journalists”, the flagship journalism initiative of the USDOS’s 75-year-old “International Visitor Leadership Program”. During the seven day gathering from November 4 – 10, 2015, nearly 100 journalists from 80+ different countries examined the essential role of independent media in fostering and protecting freedom of expression and democracy around the world. The program is named in honor of legendary radio news reporter Edward R. Murrow, whose career included historic broadcasts during WWII, and who was later appointed Director of the US Information Agency (now a part of the US State Department). Kenyan television host and journalist Olive Burrows (above) joins fellow Murrow and World Partnerships alum Garang John Deng to talk about the importance of the training and the global network that is the Edward R. Murrow Program for Journalists. Garang John Deng (above), journalist from South Sudan and a World Partnerships 2014 alumnus speaks about the responsibilities of "The Power of the Pen". While in Tampa Bay these journalists participated in a 2-day advanced journalism training symposium hosted and organized by the Poynter Institute. World Partnerships arranged additional professional visits to Tampa Bay print and broadcast media outlets, journalism educational programs, and briefings with the US Special Operations Command and US Central Command. The Murrow group engaged in a community service project at one of Tampa Bay’s beaches. World Partnerships hosted a dinner event honoring the Murrow journalists on Sunday, November 8, 2015 in St. Petersburg. The Edward R. Murrow Program for Journalists is a flagship initiative of the Bureau of Educational and Cultural Affairs’ International Visitor Leadership Program (IVLP) and has brought more than 1,200 foreign journalists to the U.S. Now in its 75th year, the International Visitor Leadership Program is the U.S. Department of State’s premier professional exchange program, connecting current and emerging foreign leaders with their American counterparts through short-term programs to build mutual understanding on foreign policy issues. Nearly 210,000 distinguished individuals have participated in the program, including more than 350 current and former Chiefs of State and Heads of Government, and thousands of leaders from the public and private sectors. More information on the Murrow program and IVLP can be found on exchanges.state.gov/ivlp/murrow.html.